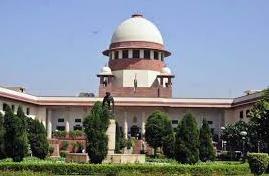 The Supreme Court on Tuesday referred to the constitution bench the challenge to the validity of the constitution amendment and enabling law to replace the collegium system for the appointment of judges to higher judiciary. An apex court bench of Justice Anil R. Dave, Justice J. Chelameswar and Justice Madan B. Lokur said that since they have referred the matter to a larger bench, the question of interim relief too will be decided by it. The National Judicial Appointment Commission Act, 2014, was challenged in a batch of petitions including by the Supreme Court Advocate-on-Record Association. Besides contending that the NJAC route for the selection and appointment of judges infringed on the independence of judiciary, the petitioners challenging the NJAC Act, 2014, said it could not have been passed in August 2014 as there was no supporting provision in the constitution. It came into effect only after December 31 assent to the constitutional amendment by President Prabnab Mukherjee. On the other hand, the government contested the maintainability of the petitions, saying that these were premature and academic as statutory provision to bring in the NJAC has not been notified and operationalised. The government had contended that unless the NJAC was operationalised and someone’s rights were affected, there was no cause of action to challenge their validity.